DRYSTAR 5302 is a DICOM-native imager, which makes network connectivity easy. For point-to-point connection with non-DICOM modalities, DRYSTAR 5302 can be used with Agfa HealthCare’s LINX Paxport. Two media sizes on-line Despite its compact size, DRYSTAR 5302 features 2 media sizes on-line, with 5 media sizes available. 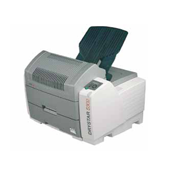 The imager thus offers enhanced flexibility and convenience, as it is not necessary to constantly load a new media format for different image sizes. With its ultra-short access time for the first film and its throughput of 75 sheets per hour (14 x 17 inch), DRYSTAR 5302 offers versatility and improved workflow for almost all radiology applications. Through its intelligent matching of Direct Digital Imaging technology, media and imager, DRYSTAR 5302 is designed to stand at the heart of Agfa HealthCare’s integrated solutions. Combined with state-of-the-art DRYSTAR DT2 media, diagnostic quality greyscale hardcopies of the highest standard are delivered time after time. Because it is heat-sensitive rather than light-sensitive, DT2 brings the added convenience of daylight loading.